Becky Hillier has become the fourth generation to join her family’s 90-year-old funeral firm Hillier’s Funeral Directors in Swindon. Becky's great-granddaughter Harold founded that company, her father Mark is managing director and her mother Val is company secretary and bereavement care co-ordinator. Becky believes that the business has benefited from remaining in the hands of one family unit for so long. As children, Becky and her sister helped with tasks such as washing the cars and helping to prepare for bereavement care events, and she also spent a summer working at the family firm’s office after graduation. Her degree in law and history took her onto four years with a building society – in a role that touched on website design, advertising and a range of other skills she will be able to use in the business – but the family business was always something that was in the back of her mind. “I always saw myself going into business, whether it be owning my own business or starting at the bottom and progressing my way up,” she said. Becky is especially proud of the aftercare service begun by her father about 18 years ago. 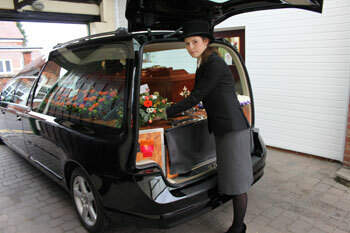 Clients are invited to come for bereavement care, and about 30% take up the offer. Every family also gets invited to the annual remembrance service, which is held in October with ministers from different religions, a choir and a band and 300 to 400 people attend.